Advantech, a leading embedded computing and intelligent applications provider, today announces the release of EPC-S201 barebone system, a palm-sized and fanless system with Intel Celeron N3350 Dual Core SoC. 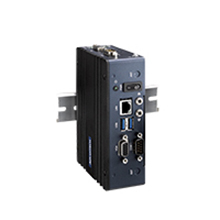 Designed with Advantech Pico-ITX embedded single board computer, EPC-S201 combines rugged design properties with flexible extension capability. Moreover, it comes integrated with Advantech’s IoT software WISE-PaaS/RMM for web-based remote management and iManager 3.0 which offers well-designed APIs including GPIO, watchdog timer, and hardware monitoring for various OS. Advantech’s software bundle helps developers to quickly design, build, and implement their own software services. Designed with Advantech’s Pico-ITX embedded single board computers, EPC-S201 measures 139 x 100 x 44 mm in a fanless design. It supports DIN rail and wall mounting for easy installation in a wide range of control cabinet platforms. Powered by an Intel® Celeron N3350 dual-core 1.6 GHz processor with up to 8GB DDR3L memory and up to 4 (optional) RS-232/422/485 ports, EPC-S201 offers multiple I/O such as: 1 x GbE port, 1 x mPCIe, 1 x mSATA, 8 x digital I/O, VGA, and 2 x USB ports for rapid data transfers and connection to third-party devices. Combining flexible configuration and easy expansion design, EPC-S201 can easily be further integrated with diverse expansion modules, additional memory/storage, digital and analog I/O, and wireless communication such as 3G, GPS, GPRS, Wi-Fi, Bluetooth, and LTE. EPC-S201 can also support 0~50 °C temp. ranges, sustain (3 Grms) vibration, shock (30g, 11ms half-sine wave), and high humidity (95% RH @ 40°C) for stable operation in industrial environments. In addition, the aluminum heatsink is for good thermal dissipation with chassis grounding protection to prevent damage from electrical surges and transient voltages. All these features make it suitable for factory automation, robotic applications, and semi outdoor kiosks. EPC-S201 also features the inclusion of Advantech’s WISE-PaaS/RMM solution and iManager 3.0. WISE-PaaS/RMM provides centralized management features including HW/SW status monitoring, remote control, and system backup/recovery. It supports server redundancy and hierarchical server management, which increases service reliability and availability, and helps customers to transform their business by incorporating powerful IoT cloud services. In addition, Advantech iManager 3.0, an intelligent self-management firmware agent, is a built-in solution chip with a standardized API that integrates several unique platform consolidating functions needed by embedded system integrators to help improve consistency, lighten development effort, and speed up product time-to-market.